Paal-Helge Haugen was born in 1945 in the Valley of Setesdal in Southern Norway; he now lives in Nodeland, near the south coast. Since 1967 he has published eighteen volumes of poetry, including two volumes of selected poems and one of collected poems. His poetry has earned him many prestigious awards in Norway and Sweden and has been translated into some twenty languages. Haugen has also published four volumes of translations into Norwegian, as well as an award-winning novel, Anne, which has been published in several languages, and works in other genres. 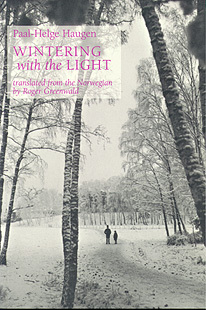 Det overvintra lyset (Wintering with the Light), first published in 1985, won both the Gyldendal Prize and the Nynorsk Literature Prize for the years best book written in New Norwegian. Roger Greenwalds English version won the American-Scandinavian Foundations Inger Sjöberg Translation Prize. Wintering with the Light is a book of poems in four parts, written in Haugens spare, honed style. Taking as his motif the light that outlasts winter, the poet explores survivals, moving among personal, historical, artistic, and political dimensions. Haugen is concerned not only with the remnants of value we inherit or seek out, but with what we can make of them and how we can maintain the meanings we discover. Roger Greenwald has published one book of poems, Connecting Flight (1993), several volumes of poetry in translation from Norwegian and Swedish, and two novels translated from Swedish. He has earned major awards for his poetry, as well as several translation prizes. Bilingual edition: Norwegian (Nynorsk) and English.